AlchemicalArrows aims to improve the bow vs. bow combat experience while staying true to Minecraft's vanilla mechanics as much as possible. This plugin adds 15 unique types of arrows in addition to the ones provided by vanilla Minecraft (potion-tipped arrows), including, but not limited to, air arrows, water arrows, earth arrows, fire arrows, grapple arrows, explosive arrows, life arrows and more... All arrows are craftable such that players have sufficient permissions and can be launched from a bow so long as the alchemical arrows are the closest arrow to slot 1 in the player's inventory (the left-most hotbar slot). All arrows provided by AlchemicalArrows affect entities in a unique way and some even have in-world effects upon hitting the ground. Others have passive effects such as the magnetic arrow which attracts nearby items! Using AlchemicalArrows' API and extensive documentation, new arrows can be added with ease by any developer whether experienced or new. There are multiple commands for AlchemicalArrows where the primary use will be for administrators wanting to further control the plugin while the server is running. All commands have associated permission nodes. Please refer to the Permission Nodes section for more information. Description: The central command for AlchemicalArrows that controls various aspects of the resource including configuration reloading, version information and administrative functionality for in-world arrows. <reload> - Reload the plugin's configuration file and load everything back into memory. <version> - Retrieve version information of the AlchemicalArrows plugin currently installed on your server. Description: Give a variable amount of any alchemical arrow to yourself or to another player. <arrow> - The namespaced ID of the arrow to give. Each arrow is assigned a unique ID. [count] - The amount of arrows to give (optional. Defaults to 1). Description: Allow the ability to shoot every type of alchemical arrow provided by this plugin. Default: All players have this permission by default. arrows.shoot.air: Allow the ability to shoot an air arrow. arrows.shoot.confusion: Allow the ability to shoot a confusion arrow. arrows.shoot.darkness: Allow the ability to shoot a darkness arrow. arrows.shoot.death: Allow the ability to shoot a death arrow. arrows.shoot.earth: Allow the ability to shoot an earth arrow. arrows.shoot.ender: Allow the ability to shoot an ender arrow. arrows.shoot.explosive: Allow the ability to shoot an explosive arrow. arrows.shoot.fire: Allow the ability to shoot a fire arrow. arrows.shoot.frost: Allow the ability to shoot a frost arrow. arrows.shoot.grapple: Allow the ability to shoot a grapple arrow. arrows.shoot.life: Allow the ability to shoot a life arrow. arrows.shoot.light: Allow the ability to shoot a light arrow. arrows.shoot.magic: Allow the ability to shoot a magic arrow. arrows.shoot.magnetic: Allow the ability to shoot a magnetic arrow. arrows.shoot.necrotic: Allow the ability to shoot a necrotic arrow. Description: Allow the ability to craft every type of alchemical arrow provided by this plugin. arrows.craft.air: Allow the ability to craft an air arrow. 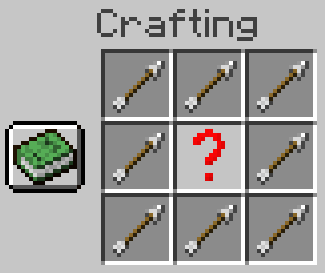 arrows.craft.confusion: Allow the ability to craft a confusion arrow. arrows.craft.darkness: Allow the ability to craft a darkness arrow. arrows.craft.death: Allow the ability to craft a death arrow. arrows.craft.earth: Allow the ability to craft an earth arrow. arrows.craft.ender: Allow the ability to craft an ender arrow. arrows.craft.explosive: Allow the ability to craft an explosive arrow. arrows.craft.fire: Allow the ability to craft a fire arrow. arrows.craft.frost: Allow the ability to craft a frost arrow. arrows.craft.grapple: Allow the ability to craft a grapple arrow. arrows.craft.life: Allow the ability to craft a life arrow. arrows.craft.light: Allow the ability to craft a light arrow. arrows.craft.magic: Allow the ability to craft a magic arrow. arrows.craft.magnetic: Allow the ability to craft a magnetic .arrow. arrows.craft.necrotic: Allow the ability to craft a necrotic arrow. Description: Allow the ability to use all administrative commands. Default: Operators have this permission by default. arrows.command.killallarrows: Grant access to the "/alchemicalarrows killallarrows" command. arrows.command.reload: Grant access to the "/alchemicalarrows reload" command. Description: Override WorldGuard protection for arrows shot from users with this permission node. CauldronCrafting: false # Whether or not to enable cauldron crafting. EXPERIMENTAL FEATURE!!! USE WITH CAUTION! - "&f&oFeel the air beneath your feet"
- "&f&oDamaged entities are launched into the air"
- "&dThis arrow is so... confusing"
- "&dWhat does this do again?" - "&8Who turned off the lights!?" - "&8Applies a temporary blindness effect to players"
- "&8Are you sure holding this is a good idea?" - "&8A sinister arrow. May instantly kill targets"
- "&7Better than the Moon in my opinion"
- "&7Burries damaged entities into the ground"
- "&dIt's almost like a portal gun, but cooler"
- "&dSwaps positions with damaged entities"
- "Ignites a fuse and explodes after hitting ground"
- "&cGather around the campfire..."
- "&cIgnites damaged entities for 2 - 3 seconds"
- "&bChill out. Snow reason to be angry"
- "&bDamaged entities cannot move temporarily"
- "&eNa na na na, na na na na, na na na na..."
- "&aThe gift of life embewed within an arrow"
- "&aA harmless arrow. Inflicts no damage & applies regen"
- "&eMay the power of Zeus be upon you!" - "&eStrikes damaged entities with lightning"
- "&dIt's almost... &k| &dMAGICAL &k|"
- "&dLaunches entities backwards with great force"
- "&7Opposites attract, likes repel"
- "&7Pulls damaged entities closer to you"
- "&2Count Dracula would be proud"
- "&2Nearby hostile entities target damaged entities"
- "&9Navigates quite well underwater"
- "&9It's as though it doesn't lose any velocity"
The highlighted question mark in the center of the crafting table represents the position in which the identified item must be placed in order to craft the AlchemicalArrow. For a more detailed description on cauldron crafting, please see the related section, "Alchemical Cauldrons". Entity (and player) effects: Launches the damaged entity in the air a random amount of blocks. The force at which the entity is launched is configurable. Entity (and player) effects: The damaged entity and the shooter of the arrow will swap positions in the world. The velocity of the target and the shooter are also switched. Entity (and player) effects: The damaged entity is propelled forwards in the direction the arrow hit. Player effects: Hostile creatures in a 50 block radius all focus upon the damaged player. AlchemicalArrows has been happily open sourced for a long time and is ready to be contributed to! If you are an AlchemicalArrows API user or if you are simply interested in the code that goes behind the inner-workings of this plugin, its source code is available on GitHub for you to browse and hack away at. You can find the source code by going to AlchemicalArrows' public repository. If you are familiar with Git, you are free to clone, fork or make a pull request to AlchemicalArrows. If I approve of any changes you decide to pull request, I may consider merging the changes into the main branch and uploading a version with your code. You will be credited in the very next changelog, as well as a link to your PR. Do note that while AlchemicalArrows is still in beta, work is being done on the "alchemical-arrows-3" branch, not the master branch! If you are to make a pull request, do so on that branch instead! The API for AlchemicalArrows has been constantly changing during its development, but it's now reached a state where it should remain relatively stable. There are various aspects of the API that can be manipulated by an external plugin, and if you're interested in doing so, you are welcome to check out the numerous pages on the GitHub wiki where you can learn how to use the most important aspects of the API. Lazo, Fong, Cruelninja101 and 5 others like this. Hi!. Thanks for this plugin!, well I didn't use it on my server but its still useful for my premium resource because ur open sourcing some of useful class that (prob) I'm gonna use!. Do note that if you use any source from this project (or even as a dependency), your resource's source must also be disclosed. The project is licensed under the GPLv3 license which also forces any project using my source or project as a dependency to be open sourced. Just be careful. You would have to open source your premium resource to abide by my license. Open sourcing your resource regardless of whether or not you use my source would be appreciated, but I am just letting you know. With that being said, if you would like to use any source from this project and chose to make changes to the class that you think may benefit this project, please feel free to fork the repository and contribute upstream. I am not opposed to reviewing pull requests. If you would like to continue discussion on what is and is not permitted with using this project's source, please do so either on my support Discord (see "Ask Questions / Get Support" on the right) or the discussion thread. Is it possible that these special arrows work with only one type of arc? the id of the arrow shot is it possible to change the skin from a textur pack? [17:18:00] [Spigot Watchdog Thread/ERROR]: The server has stopped responding! Huge fan of AlchemicalArrows been running it for around a year, dev is very nice and it's a good plugin. Also, if it's possible could you add my server to the list of servers running the plugin? :D Thank you! So dedicated! (I feel obligated to apologize for earlier versions of this plugin :P). I certainly can add your server. Let me know if anything is going wrong and I'll do my best to fix it! - chaos ..... in a good way. Haha I'm glad you enjoy this! I'm quite honestly surprised it's still in use. If there are any issues, let me know, I'd be more than happy to fix them! Don't let things get too chaotic! My players love to use this plugin to duel, finally players will stop arguing and fight like men. Thanks! been using this for a while, its a great plugin, always having fun with it. Best plugin for my server pvp skill!